You can download the free Customer Profitability Analysis to assess the profitability of your clientele on a massive scale. This tool is perfect for businesses looking to segment their clients into different niches to see what strategies work best. This free template only requires you to enter a few pieces of information and the template calculator takes care of the rest. You will receive metrics like average cost per customer acquired, the average cost per terminated customer, the average cost per active customer, and average profit loss per customer. If you want to use this template to make your business more profitable, then follow the guide below. To download the free Customer Profitability Analysis template, click the link below. You can start by creating as many segments as you want. Each page will contain 3 different segments and a total at the very end. Go through each section and the correct information listed in each. For example, in the “Customer Activity” section you will Number of active customers, Number of customers added, and the Number of customers lost/terminated. The examples show some pretty small numbers to keep it simple but you will just click inside a cell and change it to whatever you like. Similarly, you will go through and enter the profitability analysis, cost of sales, other costs, and summary metrics information. If you scroll to the bottom of this page, you will see a graph chart of all this data in a way that’s simple to understand from a glance. The color-coordinated graph displays the information mentioned above for all three segments that you listed on this page. 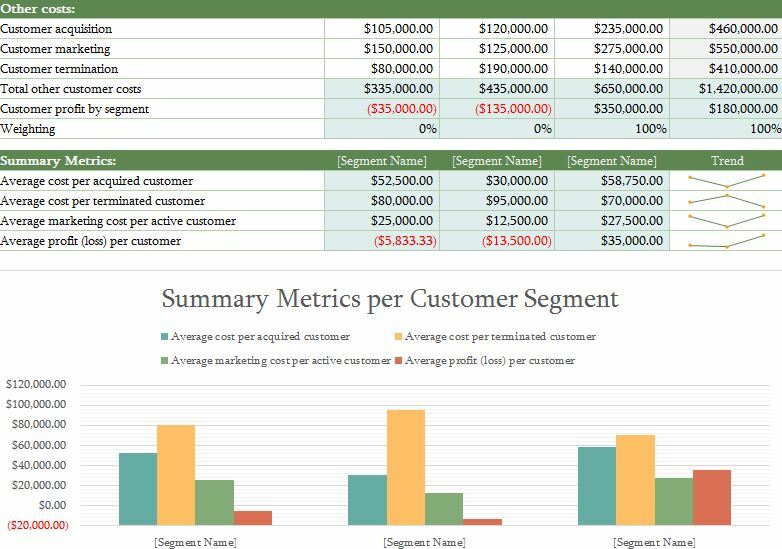 This document makes it simple for you to assess the value of your demographic and customers by entering just a few pieces of data.